Corner Cabinet Hardware with added improvements: aluminum, nonslip mat and much more!. We all know the REVO 270° Corner Cabinet Hardware, also known as Hardware ¾, Hardware for Corner Shelves, Swiveling Trays, Rotating Shelves or Corner Cabinet Shelves. 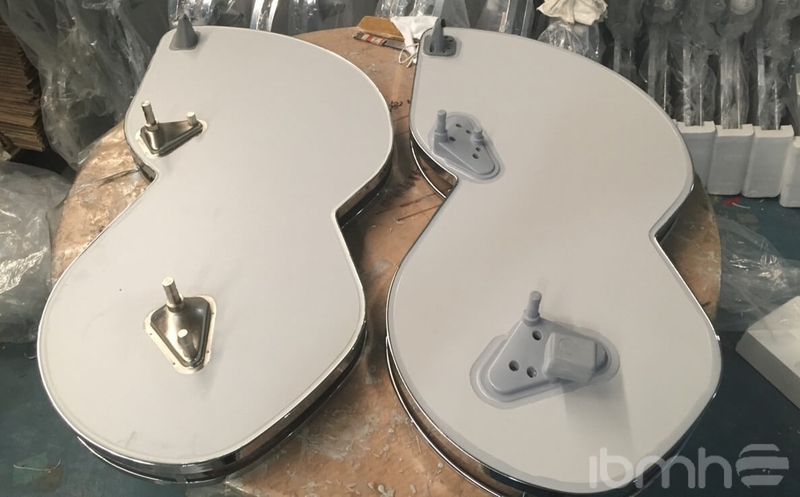 This hardware, manufactured in China, belongs to the Corner category, also known as Hardware for Corner Cabinets, Corner Pull-Outs, Hardware for Turntable Shelves or Corner Units. As a classic solution for corner cabinets in built-in kitchens, its technology is truly innovative. • The frame and baskets are packaged in separate boxes, but the product unit consists of both boxes together. • Automatic close movement. In fact, with a single hand motion, the closing speed can be adjusted without the need for tools. 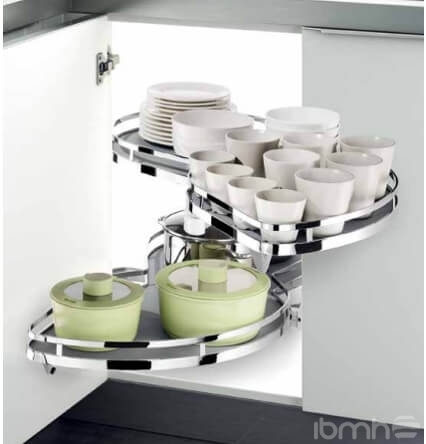 • Ideal for making optimal use of space; its shelves are adjustable in height. • A third shelf can be easily installed to add even more space. • Rotates along with the hardware a total of 360°. Upon completing the rotation, it returns to its original position in the front of the cabinet. • Uses an exclusive DUPONT ARENA nonslip system in all its baskets, preventing the contents from sliding when opening or closing the hardware. • The trays can be easily adjusted in height. They are very stable during the rotation, without any shaking or jolting, thanks to the exclusive design of the turntable structure. • The door can be quickly installed and adjusted thanks to its extraordinary, three-dimensional attachment and adjustment system. This year, a new version of this corner cabinet hardware has been developed in China with notable improvements, both technical and aesthetic. • Uses a high-quality nonslip mat. The mat is removeable, and can be taken out for easy cleaning and maintenance. • One of the major improvements over the old model is the material used for the base. The vast majority of rotating shelves are made from plastic, but this new corner cabinet hardware is made from aluminum, making the hardware more durable. • New! Shelves have a high-quality, removeable nonslip mat. • New! Joints are made from aluminum. • New! Rods have an attractive, modern appearance, thick and with a good height. • Maximum weight capacity is 30 kg (66 lbs.) and a recommended maximum of 15 kg (33 lbs.) per shelf. • Available for cabinets measuring 900 mm x 900 mm (35.4 in. x 35.4 in.). • Exclusive Soft-Stop Close provides an incredibly smooth, silent close. • Available for interior heights of 660 to 860 mm (26 to 33.9 in.). • To install, there is no need to attach it to the upper panel of the cabinet. • Telescoping central tube, allowing an exact fit to the desired measurement. • The door is installed without any tools needed, and the closing speed can also be adjusted with no tools. These improvements offer even more advantages that make this type of hardware stand out. 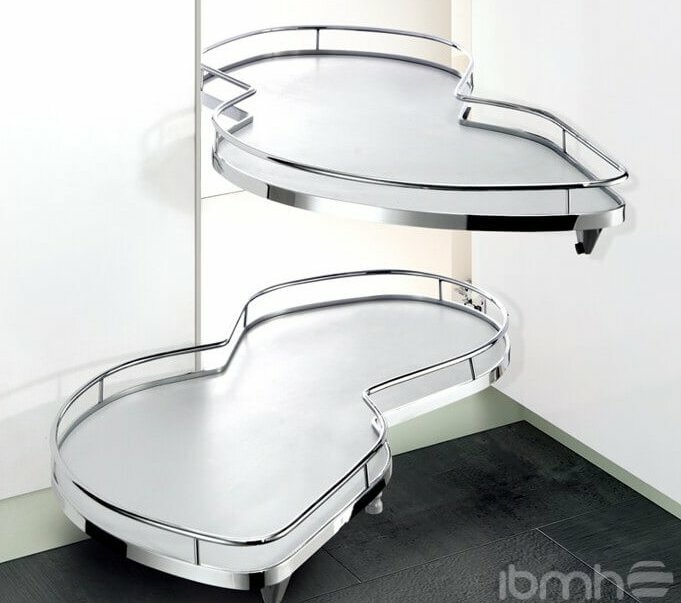 At IBMH, we are experts in Strategic Purchase Management of Hardware in China. Are you interested in this corner cabinet hardware? Contact us!